Cerkl partners are enjoying a huge wave of automated personalization from Cerkl thanks to the new and improved Aptly. 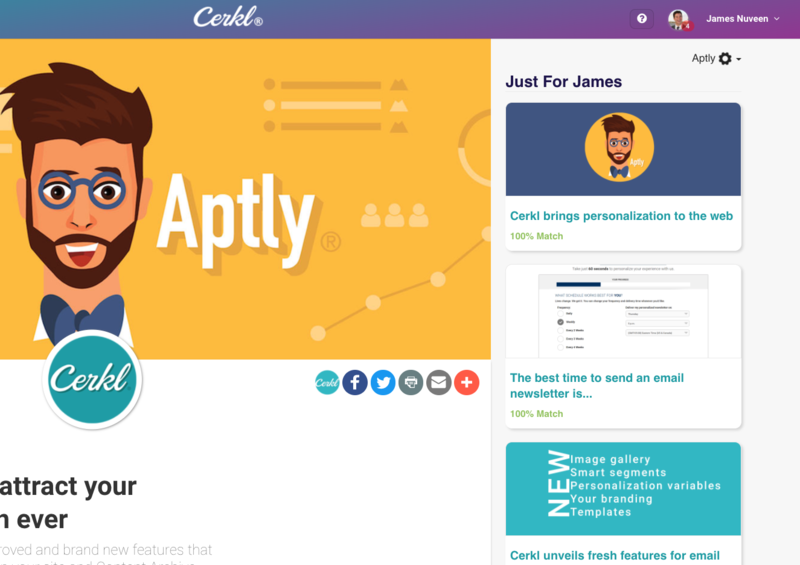 Aptly personalizes your users' experience on your site - all based on their interaction with your newsletter powered by Cerkl. Check out the sneak peek on the right side of the image below. If you choose to implement Aptly on your website, every single visitor to your site would be able to see your content, in addition to your Cerkl subscribers who receive your newsletters. However, only Cerkl subscribers' content would be personalized just for them. With the new update comes a new Aptly look. It's never been this easy to customize Aptly! With the option to choose text, headline, and background colors, there's no doubt that Aptly will look incredible on your site. Also, you can select whether certain sections appear. The Just for You tab will always display but you can toggle whether the What's Trending, Latest, and Recently Viewed sections show on your site. Below each story headline in your Aptly, either a Trending or % Match note will display. The Trending tag identifies stories that have gained traction with your Cerkl subscribers but that isn't necessarily a perfect, relevant match for that website visitor. 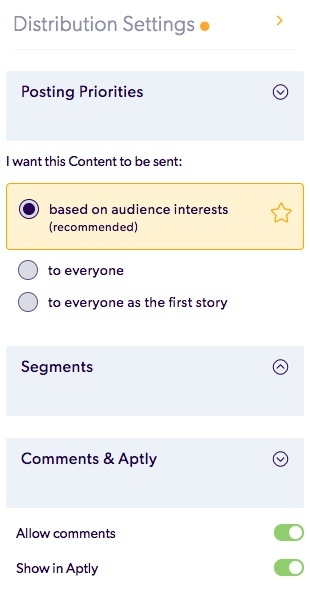 The % Match feature will only appear for Cerkl subscribers who visit your site and will rank each story's relevance keeping in mind each person's explicit and implicit interests. 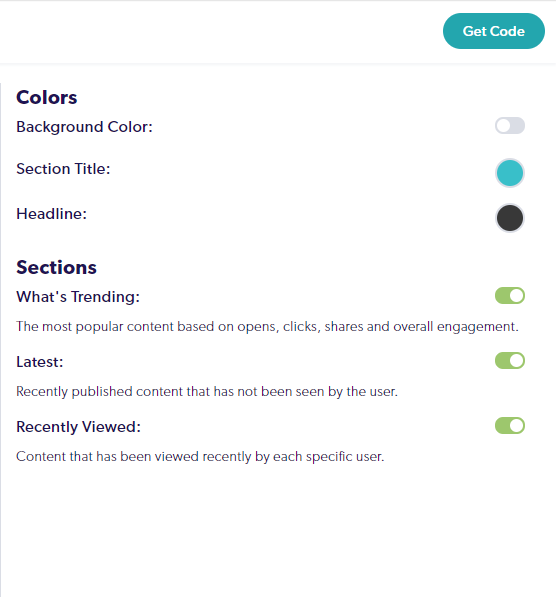 Now, when you post a Story, Event, or Link to your Cerkl, you can select whether that article appears in your Aptly on your site. Labeled 'APTLY,' it's last in the options listed below the post. To install Aptly on your site from Cerkl, select the menu and go to Settings > Integrations & Plugins > Aptly. Then, customize your display preferences (e.g. layout, sections, colors, etc) and click Get Code. Place the code wherever you want (or send it to your webmaster) to sprinkle some personalization magic. Aptly is a free benefit for all of Cerkl's partners. If you are on Wordpress, don't fret - Aptly has a dedicated plugin. This article and video highlights the process of getting Aptly on your site! Including Cerkl's subscriber plugin that easily fits on your domain, we're offering several features to personalize your website and attract more subscribers than ever before.